My family hiked a lot when I was a kid, so now it's in my blood. There are pictures of me strapped to my fathers back on the top of mountains in New Hampshire and California. 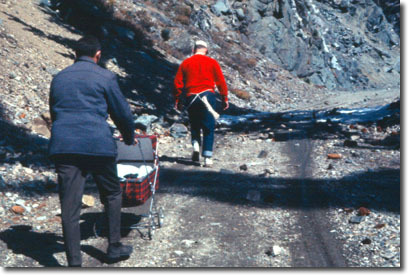 The picture on this page is of my father and uncle pulling (and pushing) me up Mount Baldy in a baby carriage. I was less than a year old. My wife and I started hiking again after my knee surgery in part to get my knee back in shape. The exercise aside, hiking is one of the best way to cleanse your soul that I can think of. The woods are a wonderful place and when you hike for hours to get to the top of some rock outcropping, the scenery makes the whole thing seem worthwhile. Imagine having lunch surrounded by beautiful scenery on all sides. And few if any other people to spoil it! One of my goals in life is to hike the Appalachian Trail from end to end. It was a dream of my dad's and he died before he could do it. If you have done it or know someone who has, I would love to hear from you! Good stories and bad are welcome. The AT goes through northern NJ, so we have hiked quite a bit of it around here. Only a couple thousand miles to go! We are hiking a lot of trails in Northern NJ, so if you know any good ones, drop me a line. And while your doing that, think about how much happier you would be if you were there right now.